๏ Undo/Redo available by swipe or touch. ๏ Shake to Clear All. Let your photos be the canvas and your finger the brush as you create personal works of art. You'll love to share. Immerse yourself in fullscreen photos as you easily apply sharp text and fun, bold brush designs in unique combinations. When you're done, upload to your favorite social networks (Facebook and Twitter) or save to your library for later. Unlike most iPhone apps, Foto Brush exports up to 2 MegaPixels, so it'll look great on computers too. When using Foto Brush, its common to serendipitously find a new combination of features that creates brand new results. There's an amazing amount of possibilities in here. · Export to your favorite social networks, like Facebook and Twitter, email your friends your latest creation, or save them to your device for later. · The Range Slider is a powerful, yet simple, way to give you precise control over the amount, or range, of each effect. · Our preview windows instantly display the adjustments you are making to text or brushes before you draw, which saves you time. Foto Brush Pro should be a dynamic part of your creative workflow on the iPhone and iPad! Checkout our video tutorials to learn more about Foto Brush Pro. 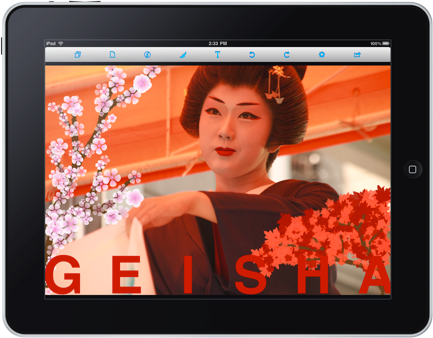 Foto Brush Pro runs on all your favorite devices, including iPhone, iPod Touch and the all-new iPad. Copyright © 2013 Bobby Cronkhite, Sam Dominguez, All rights reserved.